One of the reasons I love working with older adults is the seismic shift that can happen in their mental, emotional and physical world with relatively little intervention. The more we understand movement, the more we know that, for humans, movement is equal to life. It’s the pump that enables hydration to reach the tissues of our body, that drives our lymphatic system to do its work, that stimulates blood and other nutrients to areas that need it and, for the most part, enables us to physically experience our world. Problems, restrictions and complete breakdown mean we’re not just physically limited, but our mind and emotions are too. First up, it’s all about being able to do what you want to do. Everyone has their list of things they want to do every week, every month and every year. As we age, things can start falling off the list – people stop walking the golf course and get a cart; no more playing squash; bus tours of cities replace walking tours and so on. During exercise, but more importantly, outside of exercise, Margarita keeps life active, staying on her feet much of the day. Sitting even gives her back stiffness. But there’s more. On the tennis court, she makes a conscious effort to always fetch the balls. She has made a mental commitment to the active option in whatever she is doing, intuitively knowing this to deliver benefits. Living a full life and playing lots of different sports certainly impacts the way we age. Margarita’s life history is characterised by variety and she’s reaping the rewards now. The neuromyofascial system as well as the skeletal system, which are responsible for all things movement, responds incredibly well to vector variability, varying forces and varying speeds of force. Our tissues can be described as chaotic in their structure, so straight line forces, limited in variety and range, simply don’t create healthy adaptable tissues. Variety in the daily motions of life and in the exercise we indulge in has real value as we age (and before then too). I haven’t even touched on the mental agility benefits that result here too. This is huge. Exercise and activity can balance the stress in our lives in a number of ways. There’s a mental shift in focus where you become absorbed in the “now”, creating what many refer to as the ‘flow state’, a place where we are functioning beautifully with positivity in our physical, mental and emotional worlds. Doing exercise that we enjoy also creates hormonal changes with dopamine, serotonin, oxytocin and endorphins. Used intelligently, exercise can release pent up energy in the tissues, meaning those clenched jaws and fists can finally relax. Understanding a person’s movement style using the PTA Global mostyle tool will help enormously here. Margarita’s words about playing tennis demonstrates what exercise can do for a person: “when I play tennis, I become a different person”. It’s a holiday from the stress she feels occupies her life. Many people feel that ageing leads to poor function. A common phrase I hear all the time is “well, it’s old age, isn’t it”? I always question this – “is it?” Most of the time, people simply need new movement solutions, and often, more movement. 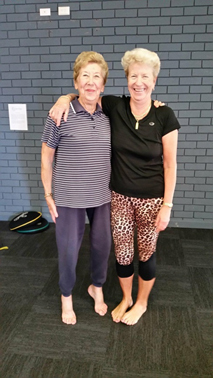 Engaging in exercise and activity gives the older adults not only enhances physical confidence, which helps them in their everyday life, but also with mental calm and emotional wellbeing. Look at Margarita (below) doing full bodyweight hangs for 30 seconds or more, every day. She plays tennis at the net because all her friends in their 60s, 70s and 80s accept that Margarita has the best reflexes in the group. Can you imagine the self-confidence on all levels that such physical efficacy can bring? Feeling robust in body translates to confidence of mind. 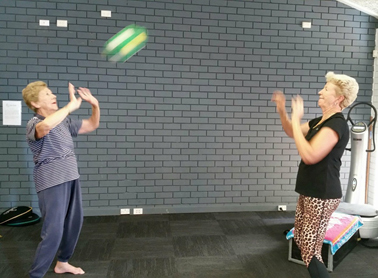 Another common theme in my older adults is having more energy, not only during sessions of course, but more importantly, throughout the day. Margarita always breaks into a run during our movement sessions. She explains most of the time that “I don’t run, but I do here!” After some great movement that opens her body and calms her mind, the energy comes. Movement becomes the method to literally “plug into” our own energy. As I said above, this often doesn’t mean a flogging, but simply activating the body’s own potential. Older adults who move will want to move more. This is a total no brainer and easily the most powerful point for the majority of older adults. Exercise and active pursuits bring people together. This is obviously incredibly good for mental and emotional health. In one study of elderly men, intrinsically motivating activities were “more likely to result in exercise continuation than activities that rely primarily on extrinsic motivation, such as the expectation of improved health and well-being” (Nielsen et al., 2014). 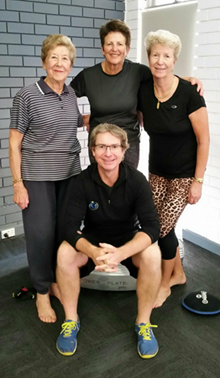 Margarita confirms this when she tells me “it doesn’t matter how good your exercises are, I wouldn’t come back if I didn’t enjoy your company and feel connected to you”. Quite thought provoking isn’t it? If I were to add a fifth element to the list, it would be to use the PTA Global Kaizen-6 feedback tool to ensure you’re delivering on client expectations. Can you tick off the above? The Kaizen-6 will ensure you can by asking the right questions. My final words are those of thanks. Thank you for reading this and for engaging with the older population whose lives are better with you in them. You’re truly making a difference, one person at a time.